Daring! Danger! Zeppelins! Clockwork animals! Buried treasure! Delicious thrills in a steampunk world that’ll get you all wound up. Amid the smoky spires of London, a wicked plot is brewing – and our brave heroine, Lily, is running for her life. Her father is missing, and strange silver-eyed men are stalking her through the shadows. What do they want? 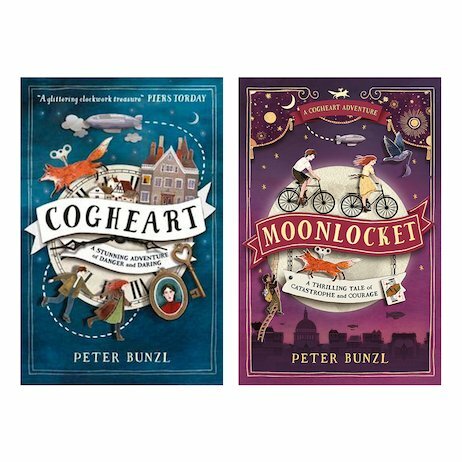 Set in a world of living clockwork creatures and ruthless air pirates, this series has all the murky secrets and menacing tension you could possibly desire. Every penstroke beats with magic and suspense. There are shocks and marvels at every turn. But will Lily and her friend Robert survive?